Now, we are in no way football fanatics. I couldn’t tell you any stats on the team or name the players or positions they run. Football is really our excuse to be lazy and bum around on the couch on a breezy, autumn afternoon. Greg and I usually wake up early to fit in a long run around the river path before the game. Not because we are health nuts, but because it makes us feel better about what we are going to consume when it’s game time! No guilt! In honor of all things kimchi I was inspired by a tasty vegetable pancake recipe by food4tots which used potatoes as a blank canvas to build flavor. The potatoes were then fried for a crunchy bite. 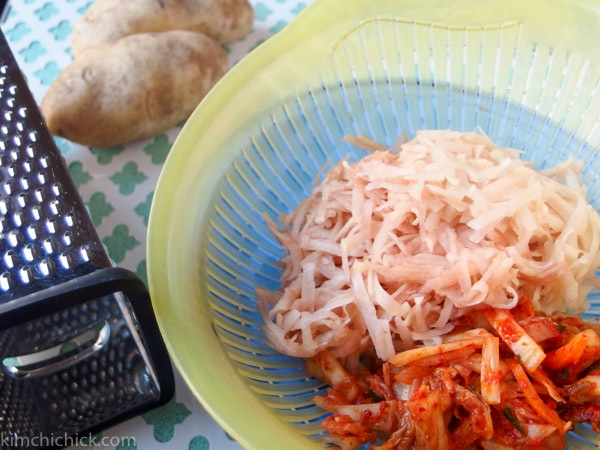 The addition of kimchi gave it a nice spicy heat that was extinguished by a swig of beer. The perfect marriage! 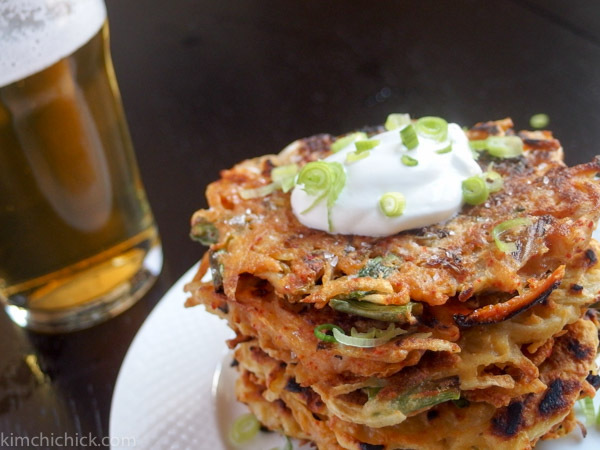 I love this Kimchi Potato Pancake right off the cast-iron skillet, served hot with a sprinkle of salt and a dollop of sour cream. Greg says it tastes like a potato skin with a kick! Try it yourself as an appetizer or bring it over to a football party. It’ll be a hit! 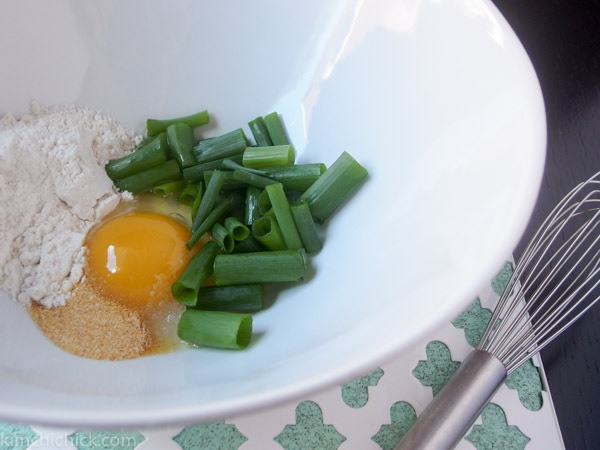 For added flavor (and protein, as Greg calls it) I sometimes add bacon bits or cooked bacon pieces into the batter. Bacon really does make everything taste better! If you try this recipe please leave a comment below or take a picture and mention @thekimchichick on Instagram so I can see it too! Enjoy! 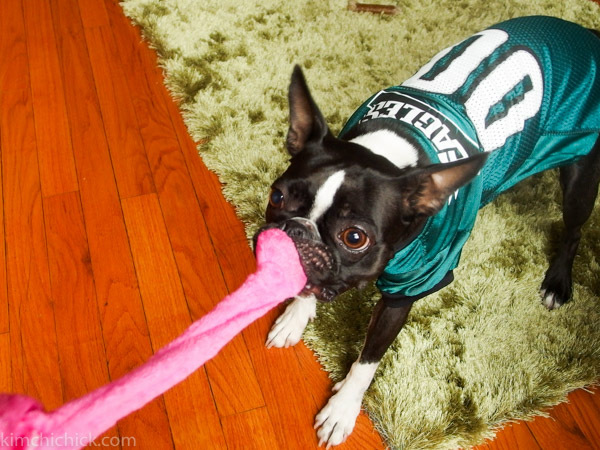 Go Eagles I hope they win! Mia’s rooting for them too! Need a game time snack? Something crispy, salty, and spicy to go with that ice cold beer? 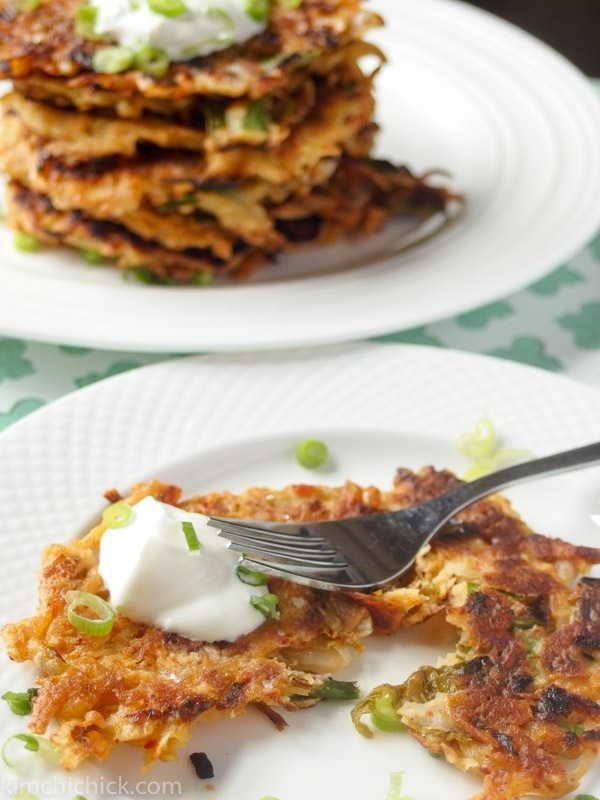 Kimchi Potato pancakes will wow the crowd at the next tailgate.